Eugene, OR — The 4th ranked Beavers took an early lead with a combination of great pitching and an explosive offense and never looked back Sunday afternoon against the Oregon Ducks, taking game three and the series by a score of 12-2. Jake Reed (6-4) took the loss with 2.2 innings of work allowing 8 hits and 7 runs, only two being earned. The Beaver’s offense jumped all over Reed early. With a combination of hits and a few bad plays on defense, Oregon State pushed to a comfortable lead and it was ultimately enough to push them to victory. 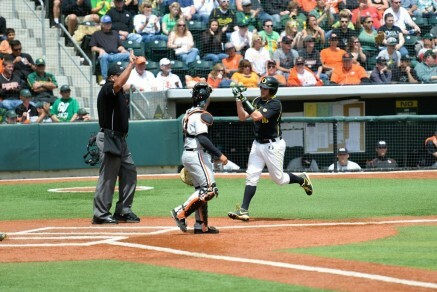 Shaun Chase comes around to score the second run for the Ducks. Oregon State (43-9, 22-5 Pac-12) took the lead scoring 7 runs in the first three innings that included a huge 5-run 2nd inning. Beaver’s slugger Michael Conforto capped the five-run inning off with a grand slam off of Duck’s starter Jake Reed to put Oregon State up 6-0. Beaver’s starter Ben Wetzler (7-1) put together an efficient 6.1 innings against the Oregon offense to pick up the win, allowing just one earned run on 6 hits and 1 walk. Oregon State’s pitching has propelled the Beavers to victories many times this season and their dominance continued this weekend, keeping Oregon hitters guessing at the plate. Oregon (43-13, 20-7 Pac-12) threatened to score in the bottom of the 2nd but Max Gordon made yet another outstanding diving catch in right center field to rob J.J Altobelli of an extra base hit. This is the second time the Beaver’s center fielder has robbed Oregon of a chance to score, this time with the bases loaded and in a crucial situation. 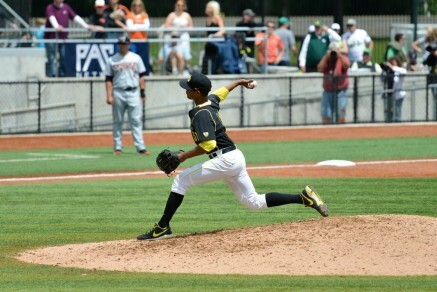 The Ducks were able to get some production in the middle innings. Mitchell Tolman came around to score on Scott Heineman’s single up the middle for his 35th RBI on the season. Heineman was the only Duck with two hits on the day; four others added one each: Shaun Chase, Tyler Baumgartner, Aaron Payne and Ryan Hambright. Darrell Hunter added 2.1 innings of scoreless work on the mound. The bullpen for Oregon also struggled; Jimmy Sherfy and Garret Cleavinger came in to get some work but in the process allowed 4 runs on 6 hits – a very unusual scene for the consistently dependable relievers. Oregon is now two games behind the Oregon State Beavers in the Pac-12 standings with just three games left to play. If both teams win their final match ups of the season then they should each obtain a top-8 seed to host regional play for the NCAA baseball postseason. The Ducks travel to Corvallis, Oregon, on Tuesday to face the Beavers in a non-conference game that won’t count towards the Pac-12 standings, but winning the game will help in getting a better regional seed and propel the Ducks into the playoffs with victory momentum.